In the spirit of gift giving, the dancers of the Bellyanna plan to give the gift of their favorite dance tune to another dancer to perform, while giving back to the community. All the music CD's will be wrapped as gifts. Each dancer has choses music, but that is not the "gift" that they may choose. Improv Roulette is a collaborative performance experiment. It is not restricted to bellydance. All forms of performance art are included. No one knows what music or theme they will perform too, or who their performance partner may be. Props and prompts are available to inspire and guide performances. The goal is to create something new, with no pre-planning. This month was Blacklight month. This month was live music month. This month was the Pirate Hafla. Arrrrrrrr. This month was Hafla-con. We dressed at comic book and sci fi movie characters. This month we had the live music (with a little dance and juggling) of Tari Lagru. This month everyone who attends the hafla is part of the fun. We welcomed Gabrielle from the Philly Improv Roulette group. This month is a little different than the rest of the year. The Newark Arts Alliance has the Holiday Art Market set up in the main gallery, so no performances this month. This month is video meetup with a side of holiday shopping!! Still pot luck, so bring a drink or snack to share. We do have small oven and a fridge if you need to heat or chill anything. This month we had BLACKLIGHT. All the dancers wore white or other blacklight reactive neon color. And the audience can always wear white or neon if you want to glow during open dance. This month we had live music!!! Tari Lagru was the base of the 6 Degrees of Separation band. If you know middle eastern music or rhythms, contact us to let us know if you are joining us to jam. This hafla will feature: live music from Brett of MAHARAL, with other guest musicians including: Jacqui, Gene, Charles from MD, Nina from Aubergine and the Brinjal Band , Sue from Philly PA, Lorelei and....more TBA. The Belly-anna is a new twist on the hafla. At this time of year, some participate in a Pollyanna gift giving. The belly-anna uses that idea, with performance music. In the spirit of gift giving, the dancers of the Dec 16th Drum and Dance Hafla plan to give the gift of their favorite dance tune to another dancer to perform, while giving back to the community. All the music CD's will be wrapped as gifts. Each dancer has chosen music, but that is not the "gift" that they may choose. All donations collects support the City of Newark Parks and Rec department. All proceeds, after rent is paid, will be donated to another local 501c. 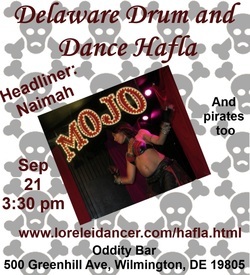 The Delaware hafla will not always be featuring one headlining act each month. Dancers with more experience are welcome to perform longer sets as time allows. Rotrica is a passionate dancer and performer. She is known for her outgoing and multifaceted dance style with a range from R&B/hip-hop fusion, American Caberet to traditional folkloric performances. Along with Barakaat directed by Shems, Rotrica is a member of Aleemah, based out of Columbia, maryland. She has appeared in Belly of Jazz's "Nina Simone Experiment" and "Petals for Billie"
She is certified in Sahra Saeeda's Journey to Egypt, has attended Aziza's DreamCamp and continues her studies with various instructors including Sacred Hipz of Washington D.C., Azhia of Philadelphia, Anitah Bah and Piper. She can be seen performing at a number of local DMV haflas and other venues. And Ro is now the hostess of the All Seasons Hafla in Towson!!! What is the Effing Hafla? 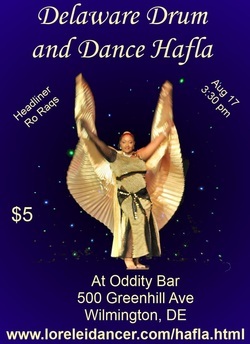 This is a hafla where dancers can perform to song with ‘explicit’ lyrics. 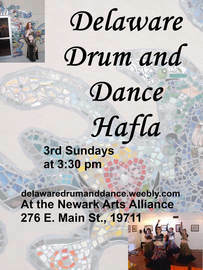 Some songs do have radio edits or be radio approved as is, but we normally keep family friendly lyrics at the Delaware Drum and Dance hafla. But not this month. Following the path of the New World Gypsy’s VooDoo Lounge and Kallisti Tribal’s Inappropriate Hafla, this month we do not limit our performers on music choice. Many inspirational songs do contain explicit lyrics, as the musical artists are passionate about their topic. And our bellydance performance artists were inspired by them. Bellydance to effing music. How the Eff do you like them apples? Residing in Delaware, Nefertiti is a professional belly dancer, instructor, performer, business owner and creator of Sambabelly Fitness. She is the president of Nefertiti Entertainment & Production Company which produces family style events. Nefertiti has been sharing for over 20 years her passion and vision for the art of belly dancing by promoting dance through education and entertainment. Nefertiti passion is working with sexual abused young girls and abused women thru dance Her style of dance is primarily Egyptian while keeping true to herself. Nefertiti performances are described as powerful, energetic, mesmerizing and hypnotic. Some have referred to her as the “essence of belly dance as an entertainer. “ She isn’t afraid to be vulnerable as she dances pain, love, joy and sorrow that relates to all women. Nefertiti is also an event organizer, producing family fun entertainment for the whole family. 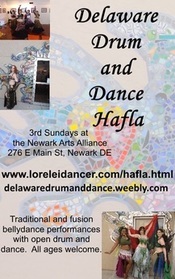 She has produced local hafla’s, intensives, workshops and festivals. She was the producer of Shaharzad, a Bellydance opera with a cast of 40 in Milton, De. Nefertiti most recent endeavor was the Jewels of the Orient Bellydance & Wellness Festival in Middletown, De. The annual festival features competitions, workshops, gala, vending and parties. As a business woman she founded Sambabelly ® Fitness and WOACA-Women of A Certain Age. Since 2006, Ishtar has been Pittsburgh's Vintage Bellydance Band. Ishtar is comprised of Melissa Murphey on clarinet and Jeff Chmielarski on electric bass. Ishtar is also the house band for Art of the Belly Festival held annually in Ocean City, MD. Phoenix’s versatile performances are marked by grace and athleticism. Will we see a warm inviting smile and the dynamic swirl of colors in a veil dance, or a smoldering glance and a swift drop into a backbend on the floor, flourishing a gleaming sword? Whatever style Phoenix chooses to present, rest assured that his audiences will be fascinated. Phoenix has been a member of multiple award-winning troupes, including Naimah's Amandari. He began studying the various forms of bellydance in 2008, starting with classical styles such as Egyptian Oriental and American Cabaret. As his studies expanded to include Turkish Oryantal, American Tribal Style, modern Tribal fusion. He has mixed in his background in Yoga and knowledge of the martial arts to make a dance style uniquely his own. Phoenix currently certified Suhaila Salimpour School of Belly Dance. His solo performances have been described by Latifa as "fire made flesh, spicy, with a bouquet that hints at a fine merlot." 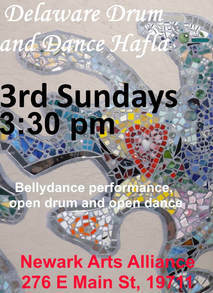 Zahra Noor is an award-winning belly dancer based in Annapolis. She has a background in ballet, modern, jazz and tap, and was also a competitive figure skater for many years. 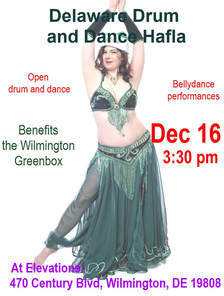 But eventually, Zahra fell in love with Egyptian style belly dancing, and got her start here in Delaware. She started training with local dancers Illiana and Maya, and has since studied with international superstars, including Katalin Schafer, Luna of Cairo, Outi of Cairo and Raqia Hassan. Zahra has performed at restaurants across the East Coast, and has participated in participated in large stage productions and competitions. In 2012, she was a featured dancer in Belly Dance Evolution, produced by Belly Dance Superstar Jillina. In that same year, Zahra was a contestant in season 2 of the reality webisode competition Project Belly Dance, produced by Michelle Joyce. Zahra is known more for her solo work, but has also been involved with troupes, including Belly Trance and the Columbia Belly Dance troupe in NYC. Omar is one the east coast's premiere belly dancers and one of only a handful of professional male belly dancers in America. He has captivated and mesmerized audiences at countless festivals and special events and can be seen at several venues throughout our area. His regular appearances include Friday night performances at Casablanca in Warrington, PA and other Middle Eastern Restaurants and Clubs throughout NJ, PA and beyond. He zills to a beat all his own and presents a performance that's like no other. History from 2010 - 2013 is on the next history page.